Blås ut et egg. Ta litt lim på eggeskallet (litt etter litt) og surr garn rundt. Fest en tråd i en avbrukket binders, fyrstikk el.l. som du stikker ned i egget for å henge det opp. For å oppnå den mørkeste fargen koker du eggene i 10 minutter sammen med overskåren løk. Avkjøl i kokevannet. For å oppnå litt lysere farge, koker du også i 10 minutter, men tar de opp av kokevannet med en gang. For å får turkise egg, koker du disse sammen med et kvart rødkålhode i 10 minutter og lar eggene avkjøle i kokevannet. Ønsker du grønne egg? Da legger du spinatblader i vannet. Mørke brune; bruk kaffe. Kraftig gul; gurkemeie. Blålilla; blåbær. Eller du kan rett og slett bruke konditorfarger. Fest gult silkebånd rundt egget ved hjelp av lim og lag en sløyfe på toppen. Eller du kan feste en tråd i en avbrukket binders, fyrstikk el.l. som du stikker ned i egget for å henge det opp. 1. Cut one of the paper plates in half. 2. To make the ears, cut half-moon shapes from the pink paper, and trim them so they are smaller than a plate half. 3. Glue each half moon in the center of a plate half. 4. Position the ears on the other plate and staple in place. 5. Cut out openings for the eyes and trim around the mouth to shape cheeks. 6. Draw on a nose and whiskers. 7. Punch holes on the sides near the child's ears and secure a length of elastic so the mask fits snugly on your child's head. Alternatively, your child can color the insides of the ears pink. 1. To make each chick, use the scissors to cut a single egg cup from the egg carton for a body. Trim along the top edge, keeping the sides of the cup as tall as possible. 2. With a colored marker, outline a chick's head and neck on the underside of the carton top. (Use the molded portion of cardboard that separates the eggs.) Cut out the head and glue the base of the neck to the inside of the body. 3. For the chick's wings, cut a second egg cup from the carton, this time trimming the sides about 1/2 inch from the bottom. Then, cut the cup into halves. Holding the half cups with the bottoms up, fit them onto the sides of the chick's body and glue them into position. 4. Once the glue dries, brush on a coat of the yellow tempera paint. Allow the paint to dry thoroughly. Next, use colored markers to tint the beak orange and draw on eyes. 5. Finally, cut a pair of feet from carton scraps and color them orange. Glue the feet onto the bottom of the body, and the chick is ready to fill with Easter candy. 1. Cut a pair of petal patterns from craft foam download For the center hole, trace the end of a cardboard tube, then cut out the circle. 2. To make the stem, glue a piece of green craft foam around the cardboard tube, using masking tape to secure it until the glue dries. 3. Push the foam-covered stem through the holes in the foam petals and set an egg in place for the flower center. For added stability, place a sealed sandwich bag of uncooked rice or beans inside the stem to anchor it. 1. Flatten the rounded end of each egg by pressing it on a hard surface. Hold this end and drizzle glue on the opposite half. Press the end of the yarn into the glue at the egg's tip and spiral it around the egg. When you reach the midpoint, cut the yarn. 2. Apply glue to the egg's uncovered half and wrap as before, again working toward the middle. 3. Cut ears, a pig nose, and faces from felt. To make ear creases, dab glue on the ear's bottom edge and pinch from the back. Pin the creases in place until the glue sets. 4. Glue the ears and pig nose to the faces and attach the faces to the eggs' flat ends. Use ball-head pins for eyes, then draw on noses and mouths with a marker. 1. Cut or tear the cups from an empty paper egg carton. 2. Use nontoxic acrylic paints to coat the insides white and the outsides tan or beige. 3. Once the shells are dry, fill paper candy cups or mini bake cups with yellow jelly beans and place them inside the shells. 4. 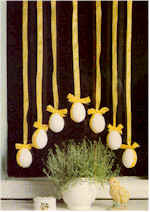 Then set a pair atop a small nest of Easter basket grass beside each place setting. 1. Paint two beads (one larger and one smaller) with acrylic paint. 2. Bend a pipe cleaner into an M shape. 3. When the beads have dried, bend the ends of the pipe cleaner under the larger bead to form two big feet, and adjust the loops above the smaller bead for ears. 4. Glue on a mini pom-pom tail. 5. Use a fine-point pen to draw on eyes, nose, and whiskers. 1. Remove the stems from the flowers. For each eye, loosely fold an 18-inch length of floral wire in half and twist the loop end tightly around the flower. Position the flower on the bottom of the basket, threading the ends of the wire through to the other side, then twist the ends to hold the eye in place. 2. To make each beak, cut a kite shape from the craft foam. Fold a 14-inch length of floral wire in half and twist it to form a small loop (a). Fold the foam over the loop and staple it as shown (b). Attach the beak as you did the eyes. 3. For the mama owl's feet, paint the sticks and allow them to dry. Place the sticks in the ground and set the larger basket on the legs, securing it with floral wire if necessary. 4. To make the owlet, place the smaller basket on the whisk-broom feet and prop up the basket with the wooden stake or stick. 1. Cut two semicircular ear shapes from the sides of one paper plate. Staple them to the back of another plate. 2. Make four cuts down the side of a muffin cup and fold two sections to the center to create a bow tie. Staple in place. 3. Add jelly bean eyes. Cut whiskers from a third, smaller plate and teeth from white paper. Place them in the center of the second plate and hold in place with the kiss. 1. For each egg holder, cut a cup from the egg carton as shown. 2. Paint the cup inside and out. Let it dry, then paint on the beak. 3. Glue on the tail feathers and bead eyes and put a dyed egg in the cup. 1. For each, cut a cup from the egg carton and punch 3 holes as shown. 2. Cut 3 pieces of ribbon, each about 9 inches long. Thread an end of each piece through a hole in the carton and knot it, then tie the other ends of the ribbons together. 3. Cut two 2- by 6-inch rectangles of tissue paper, one with the pinking shears. Lay the pinked rectangle on top of the other. Wrap the papers around a blown egg so that the pinked edge peeks out from behind the straight edge. Secure with the glue stick. 4. Place the wrapped egg in the cradle. Use the glue stick to attach a small tuft of feather and a card stock beak and eyes to the egg. Make pupils on the eyes with the marker. 1. First, make a fold about 3 ½ inches from one short end of a 6- by 9-inch piece of green card stock. Fold the paper again, in the opposite direction, about 2 inches from the other end, as shown. 2. Trim the shorter flap to resemble grass, then write a springtime greeting or a guest's name across the top of the card. 3. Glue on baby chicks using ¾-inch yellow pom-poms for the bodies and ½-inch pom-poms for the heads. Then glue on black seed bead eyes and tiny beaks cut from a piece of folded orange card stock. 1. Cut the top from a clear 2-liter soda bottle. 2. Find a flowerpot that fits inside the dome. Fill the pot with potting soil, then plant the seeds according to the packet directions. Tip: Consider planting herbs, such as parsley and basil, that can be transplanted outside once the weather warms, or grass, which grows fast and is fun to trim with scissors. 3. Place the pot on a saucer and poke in a craft stick marker. Slip the dome over the pot. Be sure to water the soil when it looks dry. 1. Cut six 7-inch petals (as shown) from white card stock and two 8-inch leaves from green card stock. Fold all 8 pieces in half lengthwise. 2. Use tacky glue to glue together the bases of 3 petals, creating a ring with a hole (about 1/2 inch across) in the center. Repeat with the remaining petals to create a slightly tighter ring. 3. Give your lily some distinctive speckles by splattering the leaves with an old toothbrush dipped in diluted acrylic paint (a great job for kids). Allow the glue and the paint to dry. 4. To make a trio of stamens, slip 3 plastic tri-beads onto the ends of three 18-inch lengths of 20-gauge florists' stem wire and bend the tips to secure the beads in place. Feed the opposite wire ends through a round wooden bead, then glue the bead in place about 2 inches below the tri-beads. 5. Feed the wires through the narrower ring of petals followed by the wider ring, offsetting the petals slightly. Glue the petals together and to the bead and let the glue dry. 6. Wrap a 2-foot section of floral tape around the base of the lily several times to secure it to the wires, stretching the tape while you wrap to help it stick. Continue wrapping the tape along the length of the wires, adding the leaves partway down. Finally, gently roll the petals over a large marker to curl the tips. 1. Have your child trace his hand onto a piece of white card stock (regular paper works too but isn't as durable) and cut out the shape. Cut two double leaves from green card stock and punch holes in the centers where the leaves meet, as shown. 2. Curl the paper fingers and leaves by wrapping them around a pencil. 3. Wrap the hand around the top of a green plastic straw and secure it with tape. Slide the leaves onto the straw and tape them in place. For the flower's stamen, fold half of a yellow pipe cleaner in half and curl down the ends. Insert the folded end in the straw. 1. On the craft foam, draw the shape of a bunny's face with a light pencil line. It should be about 3 inches wide and 5 inches high. 2. Cut it out using decorative-edge scissors. 3. Trace and cut out a second, matching face. 4. On each face, glue on a pair of googly eyes. 5. From a contrasting color of craft foam, cut out two shapes for the insides of the ears and glue them in place. 6. In the middle of each face, use regular scissors to cut two slits large enough to accommodate your child's shoelace. 7. Thread a jingle bell into the center of each lace, then through the slits so the ends come out the back of the bunny's head. 8. To make the cheeks, glue on the pom-poms just below the jingle bell nose. 9. Thread the laces into your child's shoes and tie into a bow. Make and decorate tiny eggshell plant pots for Easter. Then watch your plants grow. A small square of cardboard or a small piece of a pipe cleaner. Clean eggshells and dry them gently. To give the tiny plant pot a solid base, glue a small square of cardboard to the bottom of the eggshell (or use a small piece of pipecleaner twisted into a circle ). If using white glue, let it set for a few hours; hot glue will set in a few minutes. Using tempera paint or markers, decorate the eggshells. Let the paint dry. Put potting soil in the eggshells (fill a little over half way). Add many grass seeds or two bean seeds (in case one doesn't germinate). The grass seeds take a few weeks to germinate, but bean seeds will sprout in just a few days. Cover the seeds with a little bit of soil, and sprinkle lightly with water. When the seeds sprout, put the tiny plant pot in a sunny spot and enjoy. Clean eggshell halves and dry them gently. 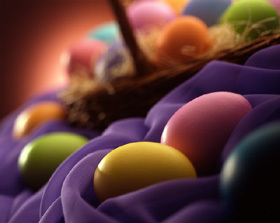 Or, for an easier craft with more durable flowers, use foam egg carton sections. Cut the cartons sections to look like a tulip. Using tempera paint, decorate the shells to look like tulips. Let the paint dry overnight. When the paint is completely dry, add details to the tulips using markers. Twirl one end of a green pipe cleaner into a spiral shape (this will be glued onto the base of the tulip). Glue the spiral to the tulip (if using white glue, let it set for a few hours). Make cute Easter bunnies from a plastic egg, pom-poms and fun foam (or construction paper). You can even hide some Easter candy inside your bunny for a special Easter treat. Cut two large white bunny ears that will go with your plastic egg. Cut two smaller pink ears that will fit inside the white ears. Glue the smaller pink piece inside the larger white piece, with the bottoms lined up. Repeat for other ear. Glue the ears to the top of the small end of the egg, spacing them about 1/2" to 1" apart. Glue the two white pompoms on the front of the egg just above where the egg opens up (these will be the chubby cheeks). Glue the pompoms together on the egg, then glue the pink pompom on the center, on top of the white pompoms, smushing it a little in between and up against the plastic egg. Glue on the eyes; they look better if they are a bit over-sized. Put candy inside your bunny for a special treat.